What the heck is this person doing? They hardly ever tweet. They follow 733 different people. 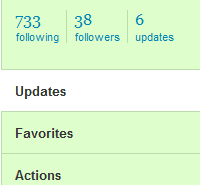 The 38 followers are people who follow anyone who follows them, so it’s sort of a feedback loop. Why do people do this? What is the benefit? I don’t get emails from them. Their updates don’t show up anywhere I can see. It just seems wierd. Are these people addicted to Twitter? I am already nervous about following Guy Kawasaki. He tweets alot and is crowding the Digsby window. 19,509 updates!! Holy fish paste! Guy is either seriously addicted or makes $10 per tweet. Guy is a legend, so I have to assume it’s the latter. I’ve only updated 57 times. I would need to update 10 times a day for 5 and a half years to catch up! Seriously. Twitter only stores his last 6,400 updates, so I don’t even know what his original tweet was. This interview sheds alot of light onto Guy’s Twittering. I am going to stop following him…it’s too much info. Sorry Guy. It’s not you; it’s me. GK uses automated tools to send out some (many? most?) of his Tweets. It’s not uncommon — you can push your blog posts to Twitter, and also use tools like SocialToo and TweetLater to automate your Tweets. 1: 19 (38%) internet sites that just support other internet sites (search engines, online advertising companies, ways to get online, and internet/computer support). These have a net value of zero, since they are only as good the rest of the internet they support. 2: 9 (18%) social communications sites (personal, video, or image communications). These have some value, but I think overall, these are not contributing to progress. 3: 7 (14%) research sites. Hooray. 4b: 5 (10%) shopping sites. I think these are a positive since they increase competition and also fit into the research arena. 6) 4 (8%) news sites. These are good, not that much better than a newspaper, but still an improvement. 7) 1 (1%) game site. Facebook and MySpace are the fourth and fifth most visited sites. Uggg. Wikipedia is #8, hooray. Dan, great comment, agree with you. Digging for value in all the twittering takes more time than it would take to actually come to understand and/or find out these important things by yourself, without reading someone else’s tweets.